I am very happy to say that since using Secrets to Dog Training, teaching Maggie who the Alpha Dog is, using command enforcement and frequent training sessions have helped tremendously. We enjoy her so much more and she is very well behaved with a few things that we still have to work on. Thank you so much for all your help. 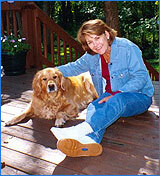 Because of your books we are now able to keep our pet and enjoy working with her and it has changed our lives. We are now so much more aware of her needs and her wants. Thank you again.